A little research revealed that dandelions have many good qualities. Although bitter-tasting, they are surprisingly nutritious containing calcium, iron, vitamins B and C, just to name a few. Dandelions also have medicinal uses. They are such a great diuretic that children sometimes wet the bed after playing with them. Who would have thought that bed wetting could be caused by playing with dandelions! The milk from the stem helps repel mosquitoes and cure worts. 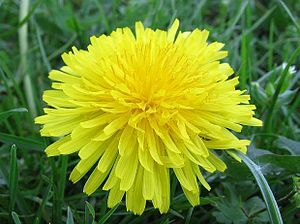 Herbalists recommend dandelions for problems with gall bladder, pancreas, and kidneys. So, what many consider as a pesky weed on their lawn, actually has many beneficial qualities. Attitudes can sometimes resemble dandelions. Maybe they seem attractive initially, but upon tasting we find they are bitter. Then there are those who come across as bitter and harsh, but as we get to know them we see all the good qualities they have to offer. Psalms 73:21 says, “Then I realized how bitter I had become, how pained I had been by all I had seen.” Times of struggle may temporarily change our view of life from one of beauty to one of bitterness and pain. It may be such a slow process that, like the psalmist, we suddenly realize our attitudes have shifted from joy to bitterness. The Psalmist goes on to say in verse 23, “Yet I still belong to you; you are holding my right hand.” How amazing that even when I am so bitter I don’t even like myself, I am still a child of God. He does not give up and toss me away like a wilted dandelion. Instead He continues to hold my hand and guide me through the bitter attitude and the circumstances that caused it. Like my bouquet, our situation depends on our perspective. We may have become bitter from the physical or emotional pain we have suffered, but the beauty is that we still belong to God. He sees all the good qualities that He has instilled in us and the potential that we have. After all, “we are God’s workmanship, created in Christ Jesus to do good works, which God prepared in advance for us to do”(Ephesians 2:10). Regardless of how bitter we become, He created us for good, and He has prepared us to accomplish that good. God constantly holds us in His hand like a beautiful bouquet, bitterness and all, and He continues to loves us through it. Whatever is causing bitterness in your life, ask God to reveal the beauty and restore your joy today. Bitterness can be a hard weed to eradicate, but you’ve given us important strategies to implement: 1) Affirm the positive, starting with our relationship with God. (And what an amazing start that is!) 2) He sees good in us; we need to acknowledge the good also. 3) God has planned worthwhile works for us to accomplish; focus on that. 4) He will love us and lead us through the bitterness until all we taste is the sweetness of life with Him once more. Thank you, Tresa! Bitterness can get a stronghold on a person that is so hard to deal with and heal. If not resolved it spills over into other aspects of life and steals a persons joy! You can almost tell by a person’s countenance when they are bitter, it shows. They seldom smile and you don’t hear them laugh out loud hardly ever! They make excuses like “they don’t like me” or “I never get invited” and then there’s the old stand by, ” I just don’t fit in”! How sad…..The Lord meant for His children to be happy! !